After the deadly Market Street building collapse, what's changed? CITY COUNCIL is holding a series of special investigative-committee hearings in response to the deadly Market Street building collapse. A grand jury has been convened and lawmakers in Harrisburg are introducing legislation to prevent another tragedy. 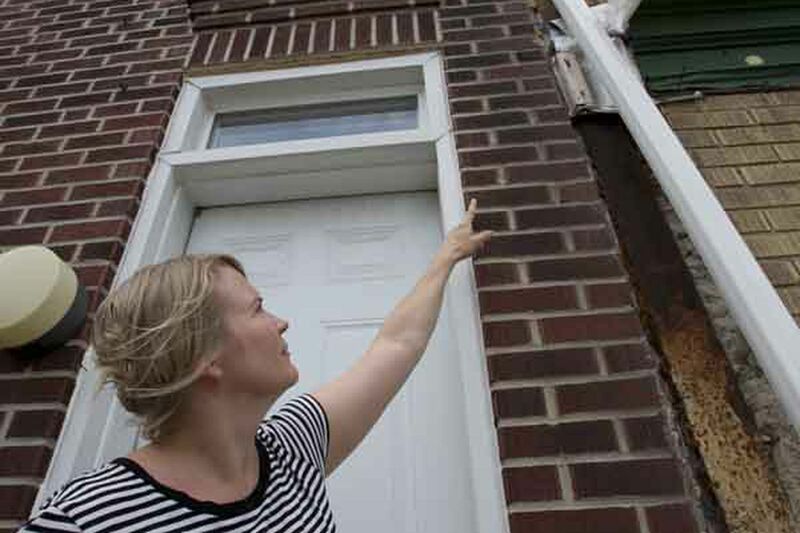 Meanwhile, out here in the real world, Heather Evans anxiously awaits actual change before pieces of her neighbor's neglected home come crashing down on her. The structural engineer's report can't be any clearer: Evans' neighbor's house on Passyunk Avenue near Washington is dangerous. The front wall is bowing out, flashings are loose and falling off of the wall, the downspout is loose and falling. It's also not properly connected to the wall or connected to city storm pipes. Brick joints are open for water to flow into them and into the party wall shared by Evans and her neighbor. The extensive water damage to her ceilings, walls and windows was clear when I visited her. So was the pitiful condition of her neighbor's house. Bottom line: The report - written in response to an insurance claim for repairs - states that Evans can make as many repairs as she'd like to her home (and she's made thousands of dollars worth) but until her neighbor takes care of his neglected property, it's a waste of time and money. Evans "must continue to be vigilant with the city to make sure that the city forces proper repairs . . . before someone gets hurt and/or before additional property, cars, etc. are damaged," the report said. Evans has more than done her part, even if she was reluctant to go to L&I at first. When you share a wall with a neighbor, the last thing you want to do is make things uncomfortable. But after he repeatedly made empty promises or ignored her pleas to make repairs, she said she had no choice. So, over the last year and a half, the nonprofit worker and her boyfriend, Ian Kinzler, a librarian, have diligently filed complaints with L&I. They've followed up. They've called and emailed, and then called and emailed some more. Evans has also made sure she was home for inspections, if you can call someone showing up and spending five minutes eyeballing her neighbor's property an inspection. For their part, L&I has followed procedure. Department spokeswoman Rebecca Swanson said inspectors have gone out 11 times in a year-and-a-half in response to Evans' complaints and routinely cited her neighbor. He's due in court next month for not complying with some of the repairs. Two separate inspectors inspected the building on two dates in June, Swanson said, and both found that the building has no structural issues. That contradicts what the engineer hired by the insurance company found. But although L&I inspectors must pass certification tests, they do not need a specific degree or construction-industry experience. State Rep. Bill Keller is pushing for a bill that would increase training for city inspectors. "It's [the neighbor's] responsibility to take care of his property," Swanson said. "We enforce the code." So where does that leave an exasperated city resident who fears for the condition and safety of her home, and whatever unlucky soul finds themselves nearby when something falls off it? Out of luck. Other than taking her neighbor to court, the city's L&I department is the only system in place for people who don't have the resources to pursue a lawsuit. Evans said if she had the money, she'd pay to get her neighbor's house fixed, if only to save her own. But the 43-year-old bought her house with a little bit of money her mother left her when she died. And Evans has poured every ounce of energy and money she has into the house that she clearly loves. "I feel trapped," she said. That is just unacceptable - especially in the wake of the horrific building collapse on Market Street that killed six people. Plus, an L&I inspector later committed suicide. Remember the days right after, when everyone was wringing his hands and promising to do better? Mayor Nutter apologized. "I commit to you that we will . . . take every possible action that we can take to fix whatever systems, processes or procedures that need to be fixed to better ensure our collective public safety," he said.
" . . . this tragedy reminded us that we must continue to go above and beyond what is required." When is someone going to go above and beyond for city residents like Heather Evans? DN Members Only: Neighbors unite against a developer.